What Day Of The Week Was March 17? 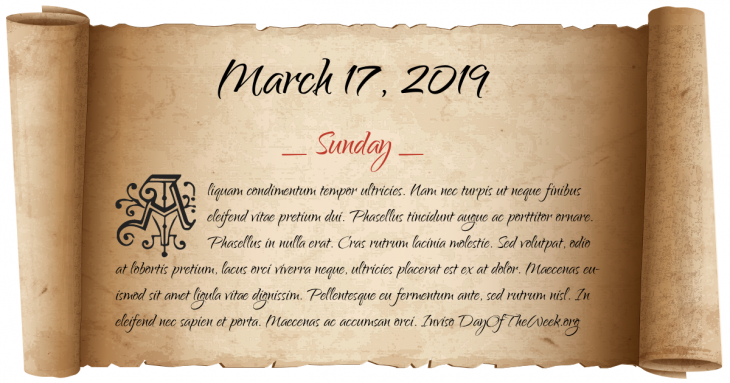 March 17, 2019 was the 76th day of the year 2019 in the Gregorian calendar. There were 289 days remaining until the end of the year. The day of the week was Sunday. American Revolution: British forces evacuate Boston, Massachusetts, ending the Siege of Boston, after George Washington and Henry Knox place artillery in positions overlooking the city. The Kingdom of Italy (1861–1946) is proclaimed. The Ludendorff Bridge in Remagen, Germany collapses, ten days after its capture. Off the coast of Spain in the Mediterranean, the Ship DSV submarine finds a missing American hydrogen bomb. Eritrean War of Independence: The Nadew Command, an Ethiopian army corps in Eritrea, is attacked on three sides by military units of the Eritrean People’s Liberation Front in the opening action of the Battle of Afabet. Israeli Embassy attack in Buenos Aires: Suicide car bomb attack kills 29 and injures 242.
Who were born on March 17?